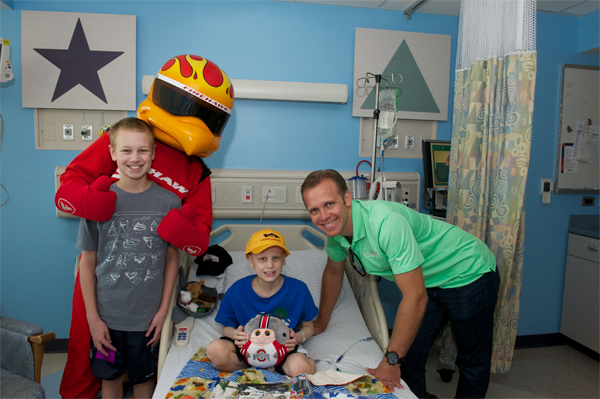 Race car driver Ed Carpenter and Fire Hawk visit with patient William and his brother. It started as a dream for a young boy who loved race cars and wanted to drive fast. The dream continued as the boy grew up, attending racing school. And then, dreams came true as the checkered flag waved and he sped off as a race car driver. He may no longer be a race car driver, but Dr. William Pinsky, a pediatric cardiologist, is doing what he can to bring smiles to children’s faces by sharing his love of motorsports with them. Celebrating its 25th anniversary, Racing for Kids is a non-profit that brings professional Indy car drivers to local children’s hospitals, while raising awareness and funds for the healthcare needs of children and those hospitals. The program has partnered with Akron Children’s for the past 24 years. On July 31 – just before a big race weekend at the Mid-Ohio Sports Car Course – Children’s was treated to a visit by Ed Carpenter, veteran IndyCar Series driver. Carpenter, a father of 3, took his time signing autographs, taking pictures and answering questions while visiting patient rooms. Fire Hawk catches Erin Pinkerton, RN, by surprise when he peeked over the nursing station. Carpenter wasn’t the only celebrity stopping by. 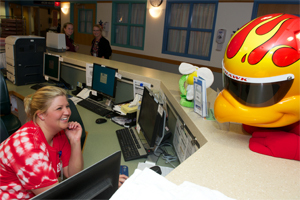 Fire Hawk, mascot for Racing for Kids sponsor Bridgestone Firestone, brought laughter from patients and staff alike with his fun antics. Parked outside the hospital was a 2011 Dallara Indy race car. Kids were able to climb into the car and imagine themselves speeding around the track. Over the past 25 years, Racing for Kids has donated almost $6 million to children’s hospitals and institutions across the country, but Akron holds a special place in Dr. Pinsky’s heart.